Okay, as long as I am on my Football tirade, explain to me how Brett Favre goes to this year's Pro Bowl and Chad Pennington does not. Let's see, Chad has led Miami to a good chance to win their division after they won only one game last year without him. He is also, last I looked, the second highest ranked quarterback in the AFC. Brett Favre, leading the league in interceptions, was ranked eighth, last I looked. If you throw the NFC into the mix, Chad is still ranked number two but Brett falls to number eighteen. And yet Brett gets to go while Chad stays home. Does this really seem fair to anyone? Okay, that is it for now. I would say no more posts about football, but I have the vague feeling I will have more to say after this Sunday's games. One thing about this year's football season, though, it has largely gotten my mind off the Knicks. Will I Become A Striped Goat? Well, I have made a serious decision. Going into the last week there is a very good chance that Miami will win their division. All they have to do is beat the Jets, which is looking easier and easier as the weeks roll buy. This almost seems like fate, and I will be vindicated for my prediction that Miami might very well do better than the Jets with Chad at their helm and an aging Packer leading the Jet's charge. I will say that there is no way I could have predicted that not only might Miami do better than the Jets but that they might win the division and go on to the playoffs. A second equally acceptable scenario, and the least likely, the Jets beat Miami and the Patriots lose. This puts the Jets on top of the Division because they will have beaten Miami twice and have a point advantage in the games they split with the Patriots, or something like that. This is still okay with me because I am a long-time Jets fan. I will kind of hate the way they will have backed into it, though. Worst case scenario, but not all that unlikely, the Jets beat Miami and the Patriots win, thereby winning the division and moving on. Also, I believe that if the Patriots and win and the Ravens lose the Patriots get in as a wild-card. If New England gets into the playoffs and neither Miami nor the Jets make it, I am going to become a soccer fan. 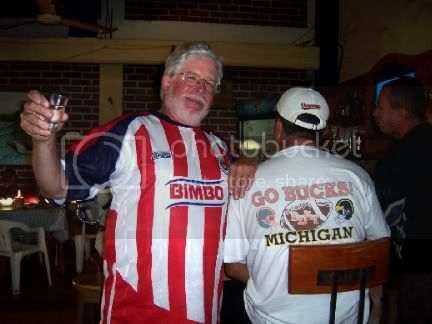 I am going to support Club Deportivo Guadalajara, more commonly known as Chivas (Goats). Because their uniforms feature broad red and white strips they are often called The Striped Goats. And you have to love a team that has Bimbo plastered across the front of their shirts. Bimbo, a large bakery affiliated with Bambi in the United States, is their primary sponsor. Well, what can you say. Chad throws for 235 yards, three touchdowns and one interception and Miami wins. Brett throws for 187 yards, no touchdowns and two interceptions and the Jets lose. Cutting Chad to pick up Brett sure looks like a brilliant move now, doesn't it? Short of a miracle, there will be no play-offs for the Jets this year.